The foremost ridge of Caudale Moor; seen here across Trout Beck, the stream in the valley, provides a good descent, the path coming down alongside the ravine of Sad Gill, seen clearly on the left. 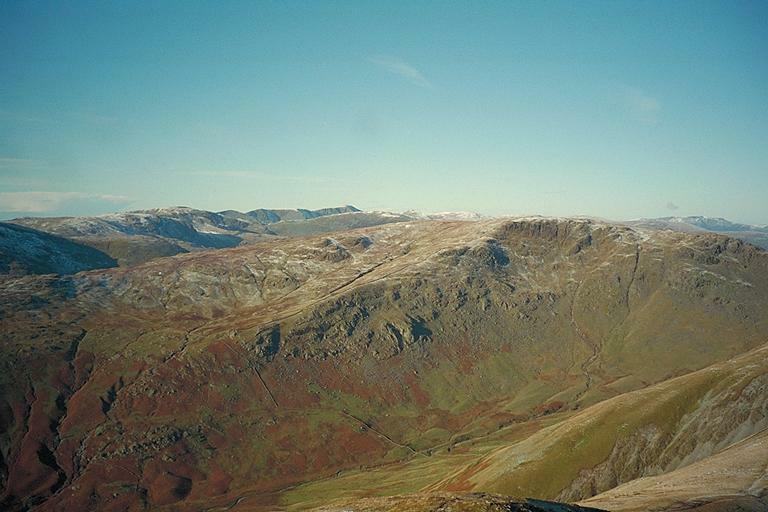 The slopes of Middle Dodd can be seen beyond, on the extreme left, with High Hartsop Dodd to its right. Beyond and en bloc are Dove Crag and Hart Crag with Fairfield behind. Further right are Dollywagon Pike; Nethermost Pike; Helvellyn; and Catstye Cam with St. Sunday Crag in front of it. On the far right, in the distance is Blencathra. Smaller version of this picture.